With over 36 years of experience and 400+ embroidery heads at our disposal, 5B’s is ready to accommodate all of your embroidery needs. Our state of the art screen print facility is equipped with six automatic screen print presses and a diligent staff ready to help with your next order. Looking for a one-stop shop? With over 200,000+ garments in our inventory, 5B’s makes it easy to purchase your goods and have them printed all with one phone call. 5B’s offers a variety of additional services including digitizing, warehousing and special garment prepping. Go the extra mile with 5B’s additional services. As a family owned company founded in 1980, 5B’s is now one of the largest contract decorators in the United States. 5B’s combines state-of-the art systems with old-fashioned values centered on you, our customer. From its humble beginnings as a specialty sewing business operated from the family’s basement, 5B’s now occupies a 170,000 square foot facility in Zanesville, Ohio. “The Factory” as most call it houses over 400 embroidery heads, seven screen print presses and operates 20 hours a day. 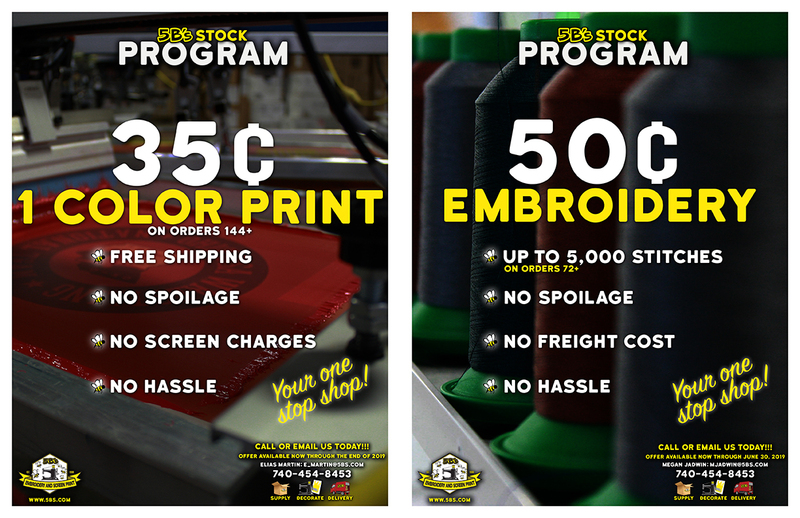 In addition to custom embroidery, 5B’s offers a wide variety of other services including digitizing, warehousing, special garment prepping, shipping and rush orders. Most recently, 5B’s also acts as a supplier – housing 10+ styles in 22+ colors from house hold brands such as Fruit of the Loom & Jerzees. 5B’s takes pride in providing our customers with on time delivery, attention to detail, great customer service and competitive pricing. We invite you to experience the 5B’s difference!!! Interested in 5B’s Embroidery or Screen Printing Services? Click the ICONS above for more Information and Pricing. all of our products and services. with you on your next project. Do you have questions, comments or need a quote? Complete the form below, click SUBMIT, and we will respond as soon as possible. Thanks for your interest in 5B's Embroidery and Screen Print. APPLICATION FOR EMPLOYMENT - 5B's INC. Please fill in all Required Fields and click SUBMIT to apply. Click the + button to add more rows as needed. State any additional information you feel may be helpful to us in considering your application. Summarize special job-related skills & qualifications from employment or other experience. Upload your resume in .pdf, .doc or .docx format. I understand that my employment with 5B’s Inc. is contingent upon my passing a urine test for drugs of abuse. I understand that if I do not pass the initial screen I am not eligible for employment. I further understand, at any time during my employment with 5B's, I may be required to repeat the urine drug test or submit to drug/alcohol testing. Failure to pass the urine/blood/saliva/breath testing may result in dismissal or disciplinary actions. I also understand that failure to submit to the urine/blood/saliva/breath testing will be considered insubordination and I may be subject to disciplinary action and/or dismissal. I willingly give my permission to the health care provider to release my urine/blood/saliva/breath test results to 5B’s. I understand that this release will apply to pre-employment, post-accident, random, for-cause, or DOT drug/alcohol screening. The undersigned authorizes 5 B's Inc. to conduct an investigation of my character, court records, employment history, academic history and/or other characteristics deemed necessary. To that end, I authorize former employers, schools, and any other person to furnish 5 B's information relevant to this investigation. I release 5 B's Inc., it agents and associates, schools and any other persons from all liability in connection with this investigation. I certify that answers given herein are true and complete to the best of my knowledge. I authorize investigation of all statements contained in this application for employment as may be necessary in arriving at an employment decision. This application for employment shall be considered active for the current year in which you apply. Any applicant wishing to be considered for employment beyond this time period should inquire as to whether or not applications are being accepted at that time. I hereby understand and acknowledge that, unless otherwise defined by applicable law, any employment relationship with this organization is or an "at will" nature, which means that the Associate may resign at any time and the Employer may discharge Associate at any time with or without cause. It is further understood that this "at will" employment relationship may not be changed by any written document or by conduct unless such change is specifically acknowledged in writing by an authorized executive of this organization. In the event of employment, I understand that false or misleading information given in my application or interview(s) may result in discharge. I understand, also, that I am required to abide by all rules and regulations of the employer. As a condition of employment, applicants and associates must agree to substance abuse testing. I understand that if I refuse to take or fail such testing, I am disqualified from further employment consideration and if employed, may be terminated. I hereby knowingly and voluntarily consent to the Company’s request to undergo substance abuse testing. I understand that the Company may require a medical examination after a conditional job offer has been made or at other times during employment. If employed, I agree to testing, including but not limited to, random testing for drug and alcohol use in accordance with the law at the time and in the manner determined by the Company. In addition, I further release the Company and its affiliates, officers, agents, representatives, and associates from any liability or damages associated with or arising from my submission to all such testing and/or medical examinations and the release of such results to the Company and or its designated representatives or agents. Once the Employment Application is successfully submitted, you will receive a Confirmation Message. (NOTE: If the Application does not submit successfully, please scroll up to ensure that all fields are filled in properly.